Some Provisional Sinn Fein supporters are currently very angry with Gerry Adams latest outburst, attacking more than 10,000 human rights demonstrators, who marched against internment at the weekend in Belfast and who were also commemorating, more than 42 years of internment without trial, as human rights activists have done annually, for almost a hundred years in Ireland. People are now calling Gerry Adams' party, British Sinn Fein, because of the extent of their collaboration with the British, particularly with regard to internment without trial, censorship and prevention of free political expression. Some say, British Sinn Fein are now more British, than the British themselves. The following statement of a Sinn Feiner from County Limerick, is an example of the growing dissatisfaction within Adams's party ranks, when he said of the anti internment protest, "Well done on your dignified march at the weekend to highlight an important issue. I've always been a SF supporter but your analysis of Gerry Adams is spot on. Their rhethoric these days is the same as that of The Workers Party about 30 years ago." The political negativity or doom and gloom of Provisional Sinn Fein, is in marked contrast, to the very positive vibe around the Anti-Internment March at the weekend. While Provisional propaganda called it the 'Dissident March in the Irish News, with a frontal assault, attacking Republican Unity, the Organizing Committee, Stewards and Participants, despite extreme provocation also from Loyalist extremists, remained united and disciplined. While it was disappointing for traditional Irish republicans, to see Adams' party align themselves divisively, with the sectarian fascist thugs of the orange order, who attempted to prevent the march going through Belfast, it is also not helpful to republican unity, for any band, despite the extreme provocation, to be playing "Take it Down from the Mast" entertaining, drunken alcoholics in any felons club, who were afraid to march themselves. It is unhelpful whatever the level of collaboration. This is history repeating itself, as during the hunger strikes, when the stickies started fighting among themselves, as the principles of the hunger strikers started to shine through. Unfortunately good people were badly misled and betrayed, some paying the ultimate price, as both officials and provisionals consigned themselves to the dustbin of history. This Rally was the Phoenix rising, from the ashes of both, once proud traditions, once again. Unity must be the watchword and lesson from that experience, with the Irish people of no property, being the only guarantors to be trusted, after the experience of so many betrayals, from native gombeen men, political careerist carpetbaggers, morphing into active alcoholic felons, riding on the backs of other Irish men and women's wounds. Both Adams and the Loyalist thugs failed miserably on the 9th of August 2013, while demonstrating how prejudiced and bigoted their hatred for human rights' activists, socialists and genuine traditional Irish republicanism really is. The 10,000 strong marchers, succeeded not alone in commemorating the anniversary of internment with respect but also highlighted the continued injustices in British Occupied Ireland today. Praise goes to the steadfastness of the marchers, along with the continued humanity and loyalty of everyone involved in the anti Internment events, which is in marked contrast to highly paid collaborators of ongoing internment 42 years later. During the Hunger strike rallies, Adams and his felons, regularly rallied around West Belfast, shouting that Gerry Fitt is a Brit, before he was burned out of his home. Seamus Lynch of the Belfast stickies gave Adams a lot of stick about it at the time. Adams and British Sinn Fein, are walking the well worn path of the Fitts and Lynchs, who stood all idly by as their Irish brothers and sisters bled. They are again walking into the same political oblivion collaborating in the internment of old republicans like Martin Corey, who has served 23 years for the Irish Cause. British Sinn Fein are in effect administering internment and damning internees with feint protest. After the deaths of the 10 hunger strikers, Adams and his Chameleon republican careerists, replaced the SDLP, who boycotted Stormont on political principle unlike Adam's party. They also stole their middle class agenda and middle class British salaries. 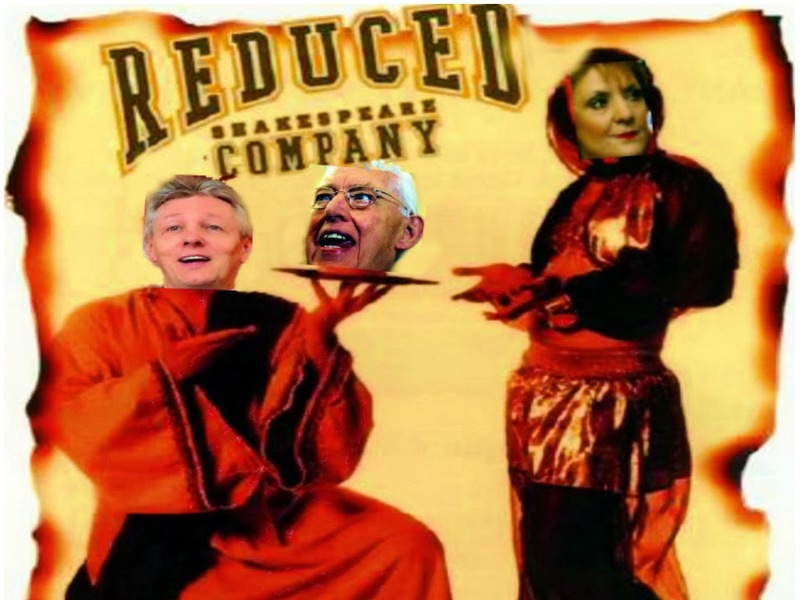 Now their Gaelic Chameleon Lord Mayor, from their Gaelic Chameleon party or was that Official Sinn Fein? wants to be addressed as Lord Millar of Belfast, while professing republican principles more akin to the entreprenuerial spirit of the Republican Bush Family of Texas. Nevertheless it is important for Ireland's sake, not to resent British Sinn Feiners as individuals, but instead what Brit Feiners, are doing to the traditional Noble Spirit of Republicanism and Ireland, like their collaborating opportunists in Fianna Fail and the blue shirts before them. Eamon de Valera, covertly co-operated with Britain to crush the IRA. Papers reveal that De Valera and entire cabinet in the late 1930s, former IRA members, asked London to help smear the IRA's Chief of staff as a communist agent. De Valera's government executed more IRA members than Britain and borrowed Albert Pierrepoint, to hang one of them.During the war, more than 1,500 were interned, while several died on hunger strike in Irish jails. Gerry Adams hasn't hung anyone yet with his own hands that we are aware of but he has hung Martin Corey out to dry with more than 3 years interned, who alreadygave almost 20 years of his life, as a Provisional IRA volunteer imprisoned in Long Kesh. There are many more currently interned by remand in Maghaberry, while British Sinn Fein share power administering it in Stormont. Now I have been warned, by someone, who professes to have strong connections with the British and American intelligence community, that I will be whacked, I.e. murdered, for campaigning against internment or divulging anymore Provisional Sinn Fein not so secrets activity, as a former Chairperson of Newry Sinn Fein before they went totally British. There is nothing personal in any of this towards any member of British Sinn Fein and I wish all of them well in their private lives outside politics. I would however strongly advise Gerry Adams and ask his fellow travelers, including his alcoholic felons, that for once, just once, to put their communities and dysfunctional Ireland first, before they go on their merry way into the dustbin of Irish history, like Gerry Fitt and the Stickies. 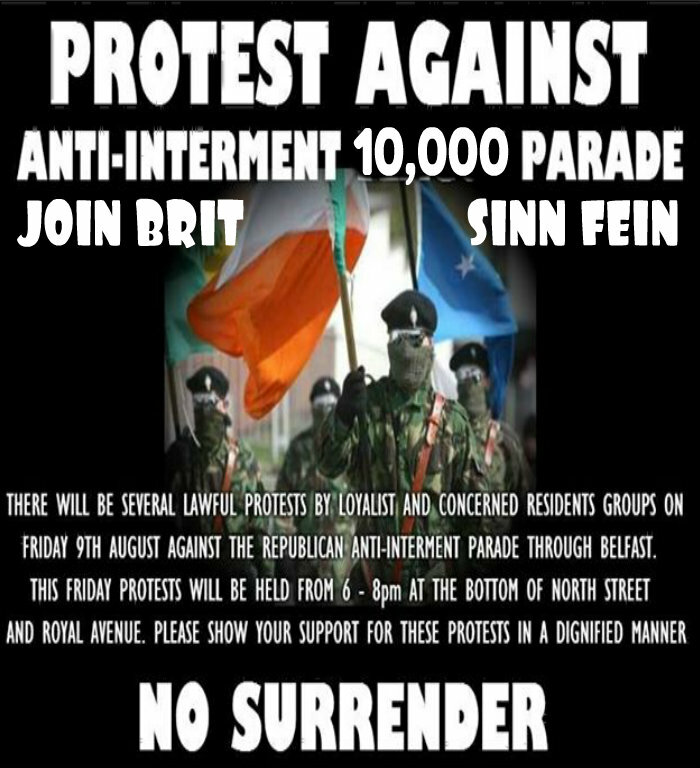 They need to sit down and work out a common strategy, with all the groups involved in the Anti Internment Rally at the weekend and work towards republican unity, instead of undermining it. That is if they can convince them, at this late stage with something positive like ending internment once and for all in Ireland. and building a lasting peace with justice for everyone, including the loyalists. Can we for once stick together and put Ireland's interests first, like our Republican martyrs of yesteryear. None of us are an island and none but a fool or child, can see the ultimate self destruction of selfishness and self-centredness, we must rebuild community Ireland.